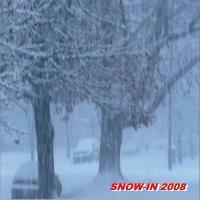 A cabin fever induced snow themed mix that I put together during December 2008 while snowed in. I made use of the electricity while it was available. The cover is a picture of my street on the day I made the mix. Modern English are more than "I Melt With You". I think I need more hot steaming coffee. So white outside now. Pixies covered this Neil Young song so well. Sambassadeur comes from a land of ice and snow. Sweden in wintertime is magic to me. I think we have a foot of snow now. For Oregon, this is wild. All life will shut down for a short while. It ain't about Christmas, it's about the snow. Hey wanna watch Gremlins then act it out afterwards? And then after that, let's go out and smash iced mud puddles? Yeah, too cold. Embarassing fact: I had no idea this was a Simon and Garfunkel cover until about two years ago. Oh Jens, you're oh so sensitive and I unfortunatley relate. Another animal in the snow song. I fed a fox once, but it was in Utah. There's a little bit of sun, but the snow will be here into nightfall. How about some hot cocoa? That's the point of this mix. It's a little bleak, a little sad, but this has been a good snow day. If I had chosen "Bright as Yellow" instead, that might have been funny in a Zappa sort of way. Dear Abbey, I prefer the spelling the word "gray" with an "e" instead of an "a", does that make me an anglophile? Oh, I also prefer the Elvis Costello to the King. This was a hidden track on the original mix, but let us not talk falsely now, for the hour is getting late. Wow. I have a CD with almost every one of these artists/bands. Very nice.